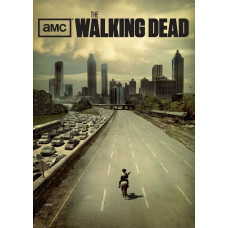 The Walking dead - Original Movie Poster 27 x 40. Andrew Lincoln plays the show's lead character, sheriff's deputy Rick Grimes, who awakens from a months-long coma to confront a new, apocalyptic world overrun by flesh-eating zombies. Grimes reunites with his family and becomes the leader of a group he forms with some of the many other survivors whom he encounters in his quest for a safe haven. Together they are forced to survive in a world filled with zombies (aka walkers) and certain humans who are even more dangerous than the zombies themselves. The first season takes place in the Atlanta metropolitan area, and the second through fourth seasons are set in the surrounding countryside of northern Georgia.